The dismissive way the Windsor Bridge is to be eliminated shows a fundamental disrespect for the dangers and endurance of those who built it and the innovative skills of those who planned it. Today with our heightened safety systems and powerful tools we can only imagine what it was like to construct this landmark engineering structure 140 years ago. It took two and a half years as work progressed through a series of floods. The work men that built it by hand are unknown. It’s opening was a landmark affair with Sydney papers producing a special addition to celebrate the linking of Sydney to the interior. The bridge was totally festooned under flowers, fruit and flags as bands played, kids marched and people came from even Sydney to walk across it. Others looked forward to the planned train tracks to be laid over it which never eventuated. It stands on a series of 10 pairs of massive piers each sunk – “.....through 12 foot of water,26 foot of sand and 12 foot of loose rock to stand and be bolted into bedrock.....”. They average the height of a 5 story building below water. The later raised additions were also of cast iron outer shell but concrete filled. Caisson construction is very dangerous and our appreciation goes out to those brave souls that went down below the water in iron tubes to dig out 100’s of tons of river bed to reach the bottom. One can only imagine what it was like in that dank dark candle lit gloom looking up 17 m to a small ring of light knowing the forces of mud and water wished to entomb you. With no dam upstream to mitigate river rises the prospect of a watery death was real. 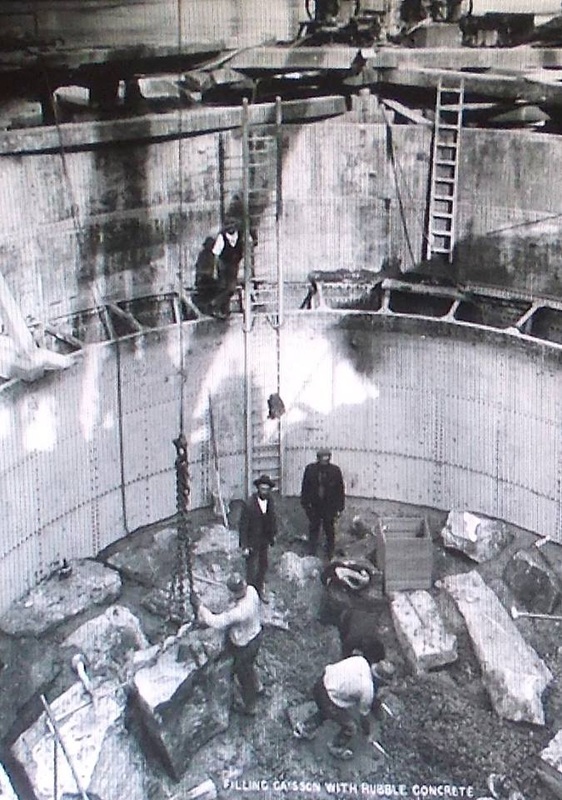 The caissons were continually topped by water and needed to be emptied out as they were pile driven ever further down. The massive pressure grew as they excavated deeper and water and silt oozed in ensured one was continually wet and cold. The real prospect of a catastrophic failure meant death. They dealt with huge weights with limited mechanical or medical assistance as they laid the 1000’s of specially shaped bricks to fill the tubes so they would not buckle under flood pressure. Unlike stationary water, this was done with the ever present horizontal force of a river. No photos of it being constructed exist but images of the building of Pyrmont Bridge 30 years later gives us an idea, even though it was shallower and more open. Earlier drawings of river caisson building show how claustrophobic it was and indeed how up with the times we were as Jules Triger’s system was only 24 years behind the planning for our bridge. The bridge deserves more respect both for its engineering innovation and the toil of our ancestors. I am sure none of us would like to descend into that world and I am sure they would like to know their efforts live on to enhance the town and give pleasure.